This is a large elliptical dining table that features a Curly Anigre veneered top with marquetry imagery of two red Tulips on a background of Ash burl. The marquetry center is bordered by dark green and white square banding framed by two thin Ebony inlays. 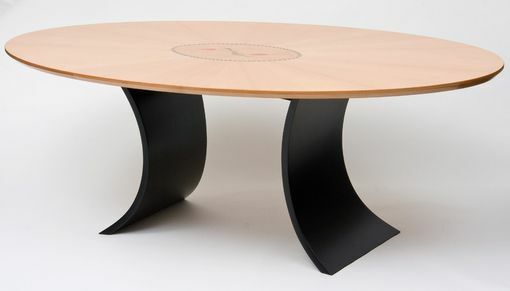 The base is composed of several curved bent laminations and is finished with satin black Conversion Varnish. 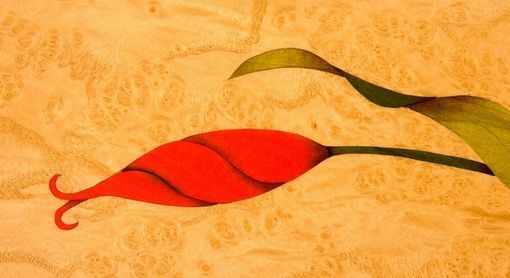 The table was designed with Tulip imagery from the Ottoman Empire and the marquetry drawings were based roughly on artwork of Tulips we found from that era.